These gorgeous amphibians live in the lush and warm tropical jungles, and their color is a warning to predators of their toxicity. These colorful guys would make a perfect addition to one of our new terrarium kits for that beautiful tropical feel to your home! Sexing can be difficult. Females can be slightly larger than males, and males can develop larger, darker pads on their thumbs. Keep singly, as uneven sized frogs will prey other each other. They also need a lot of room, so provide a large enough terrarium if keeping multiple frogs. Climate Tropical species, so it lives in the warmth and humid. 75 – 85 degrees. Provide a mild daytime basking light, with a low wattage bulb, and a heating pad for nighttime heat. Use a small aquarium heater in a bottle of water to provide both warmth and humidity. Keep humidity at least 50 percent. Mist the terrarium daily to help maintain this. Using coconut bark or forest bark as a substrate, with plenty of moss, will also help keep these frogs moist. Do not use distilled water, as tap water contains trace minerals that these frogs need. White’s tree frogs live in the trees near water. White’s also make their homes in and near homes, near cisterns and other water sources. Coconut bark and forest bark as a substrate. These are less likely to be ingested and will help keep the terrarium humid. Cage carpet can be used as it is easy to clean and can help reduce mites. Cover with damp moss to help maintain humidity. Provide plenty of places to hide and climb with caves, vines, and hanging plants. Can be housed in a 10 gallon aquarium. These frogs love to climb, so stand the tank on one end. Terrariums make excellent homes, as they are taller and have screen doors for easy access. Provide secure covering as these frogs can and will escape. Insects such as crickets, mealworms, worms, and cockroaches and even pinkies are on the menu for the White’s tree frog. Dust food with a calcium/vitamin powder just before feeding. Ensure nutritionally complete crickets by feeding them a quality cricket food. White’s tree frog will overeat if given the chance, so limit its food. If folds of skin begin to appear over the eyes, put your frog on a diet. Limit the amount of mealworms and waxworms that you offer your frog as these are high in fat. Feed a few gut-loaded insects 2 – 3 times a week. Offer mealworms in a shallow dish so that they do not escape. Mist the terrarium daily. Provide a shallow bath for the frog to rest in nightly. Change the water daily. White’s tree frogs groom themselves. Provide fresh water and plenty of humidity to keep their skin healthy and moist. Maintain a sanitary cage to prevent foot and leg infections. Limit handling of your frog as they can get stressed. Rinse hands to eliminate contaminants. Keep hands most to protect their sensitive skin. Wash hands after handling. Change the water in the dish daily. Also remove any excess water that has gathered in the bottom of the cage. Clean the whole cage every other week by removing soiled substrate and replacing with fresh. Wipe down any soiled areas. White’s tree frogs are susceptible to bacterial infections like red leg, as well as fungal infections. Most can be avoided by proper cage maintenance. Stress can also lead to illness. White’s tree frogs can also suffer from nutritional deficiency and metabolic bone disease if not provided with supplemental dusting of insects. About 6 years, but up to 12. Females are larger – 9 inches – than the 6 inch males. Males croak, especially when grabbed from behind. Pacman frogs will eat anything smaller than themselves, so keep these large animals by themselves. Keep at about 80 degrees to maintain good digestion. Use a small heat lamp to prevent drying the cage out. An under-tank heater works well. Full spectrum lighting helps in the proper absorption of calcium. High humidity can be maintained by daily misting and a large water dish. Moss and shredded coconut bark help by holding moisture. Hidden in the leaf litter of forest and jungle floors. Gravel makes a great base for the substrate as it is not as messy as soil and provides drainage. Moss and/or coconut fibers on top of the gravel to maintain humidity and to allow the frog to bury themselves. Moss will offer plenty of humidity and places for them to hide. Real or artificial plants also offer plenty of hiding places. Aquariums work well as they hold humidity. A 20 inch critter cage is fine for a home as these frogs are largely sedentary. Large crickets, earthworks, superworms, and goldfish up to pinkies, fuzzies, and adult mice. Dust crickets with a high quality vitamin/calcium powder for juveniles once a week. Adults need less supplementation – every three to four weeks – as they should get all of the vitamins from a varied and balanced diet. Feed prey items no larger then half the size of the frog. Offer some variety to ensure proper nutrition, and avoid over supplementing. Feed juveniles two to three times a week, and adults every one to two weeks. Dead prey items, such as frozen pinkies, may need to be wiggled in front of toad with forceps to catch the attention of these ambush predators. Mist the cage and change the water bowl daily to keep the humidity high. These frogs are not strong swimmers so the water dish should not be deeper than half their body. Pacman frogs maintain their healthy skin through correct humidity and minimal handling. Provide fresh water to help prevent infections and dehydration. Bacterial infection called red leg is always a risk for captive frogs. Even though they get used to being handled, this should be kept to a minimum. Dry hands will irritate their skin, and always wash your hands after handling. Change the water daily. Spot clean the cage as needed, and change the substrate every one to two weeks. Dehydration, internal and external parasites are a health concern for these frogs. Bacterial infections like red leg can be due to unsanitary conditions. Male frogs tend to have more of a wrinkled throat, which indicates a vocal pouch. They also tend to be smaller than female tree frogs. Green tree frogs are communal, meaning they get along well with one another, as well as with other reptiles that are similar in size such as small green anoles. These frogs come from southeastern parts of the US, particularly Florida. Coming from southeastern parts of the US, it is necessary for the frogs to have a humid and warm climate. Setups should be semi-tropical. Nocturnal, meaning they are asleep during the day and active during the night. During the day, it is ideal to keep the temperature between 75 – 85 degrees Fahrenheit. During the night, keep the temperature between 65-75 degrees Fahrenheit. Being nocturnal, no special light is needed. A fluorescent full spectrum light may be utilized for no more than ten hours a day. This will create a healthy appetite as well as supply emotional and physical health. The humidity level in their environment should be maintained between 70 – 80%. This may be monitored by a hygrometer. A semi-tropical environment is necessary for these creatures meaning that a routine misting is required. Since tree frogs love to climb, fixtures such as branches and sticks are also recommended. Reptile carpeting topped with moist moss is the best choice for sanitary reasons. Soil or finely ground mulch is also good to create a humid and natural environment, however, it may promote the development of parasites. Tree frogs enjoy hiding behind driftwood that is placed diagonally in their terrarium as well as behind leaves that are hanging from the walls. Live plants are great to help regulate humidity levels. A minimal 10 gallon aquarium is fine for keeping the tree frog, however the bigger the better. It is always better to have the tank taller versus wider. There should also be a screen top for proper ventilation. Being insectivores, green tree frogs will feast mostly upon crickets as well as mealworms and wax worms. It is recommended to feed supplements to the crickets so that they become ‘gut-loaded’. Phosphorous free calcium is good for absorption and should be offered periodically to prevent deficiencies. Adult frogs should only be fed 4-5 times a week and should be provided with enough food to last throughout the night. Juvenile frogs should be fed everyday. In captivity, crickets make up most of their diet, other insects are recommended. Mealworms and wax worms are a good variety. Gut load insects by giving pieces of fresh green vegetables. A water bowl with fresh dechlorinated water should be available to the frog. This should be changed out everyday. 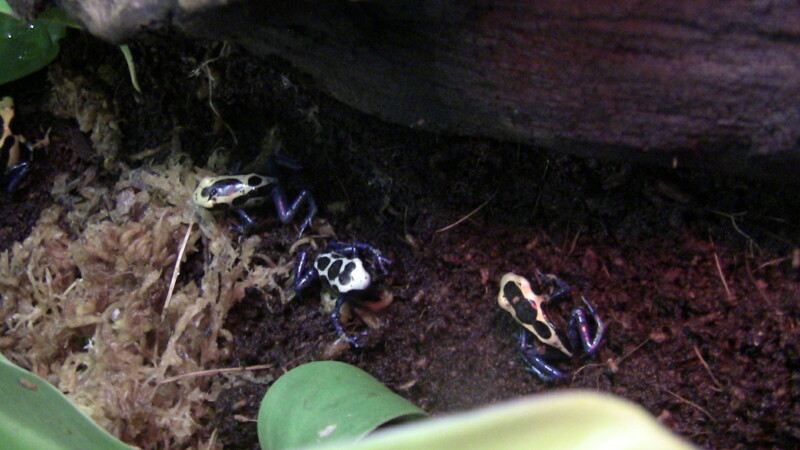 Frequent misting of the terrarium as well as of the frog is sufficient for their grooming. A small water bowl may also be available for the frog to soak in, however, do not over saturate to prevent negative bacterial growth. The substrate used should be checked in order to avoid the frog’s feet from becoming injured. Insects that have not been eaten should be removed and water bowls should be changed in order to prevent oral and digestive infections. Green tree frogs have sensitive skin and hardly like to be handled. In any case, careful and supervised handling should be utilized when handling them. Use wet hands to handle them due to the abrasiveness of human skin which may cause the frog’s skin to rub off. Clean out the entire cage once a week including the fixtures kept inside. Everything should be cleaned with hot water. If using reptile carpet, change it once very week. If soil is used as a substrate, change out every two to three weeks. Fresh water should also be available. Tree frogs are highly susceptible to stress and should avoid being handled. Runny or red streaks in droppings, weight loss, inflamed skin, and discharge should be immediately brought to the attention of a vet. Also, unsanitary and stagnant conditions will cause bacterial infection. Females are larger and brighter in color than the males. Tomato frogs are fairly compatible and can live in small groups. Beware of mixing them with small frogs, as these will be eaten. Humid areas located close to water, forest floors. Diurnal, working the day shift. 75 up to 85 during the day. Use a mild basking light or a small watt heat pad. Use high quality UVA light for emotional health and to stimulate their appetite. Tomato frogs need humidity. Provide this with a water bowl – an airstone increases the humidity – frequent misting, and moss. Banks surrounding small stream or pond. Gravel makes a great base for the substrate as it is not as messy as soil and provides drainage. Moss and/or coconut fibers on top of the gravel to maintain humidity. Avoid heavy soaking of the substrate. 20” aquariums or critter cages are ideal homes as they help hold in humidity. Feed crickets and small mealworms. Tomato frogs will also eat small fish, worms, other frogs and even small mice. Lightly dust crickets with a good calcium/vitamin powder just before feeding. Gut load your crickets with high quality cricket food to prevent deficiencies in tomato frogs. Tomato frogs eat a lot of crickets. Offer a few crickets at a time during the day. Provide clean water in a bowl at all times. Mist frequently to keep humidity high. Tomato frogs need no grooming. Care Clean the cage regularly to prevent foot and skin infections or an internal infection known as red leg. Tomato frogs are not ideal candidate for handling as our skin would both dry and irritate theirs. If you need to handle your tomato frog, wet your hands. Spot clean soiled areas. Keep the water dish clean as this is a prime area for bacteria to grow. Tomato frogs are susceptible to skin lesions and bacterial infections called red leg.